RETIRED senior superintendent in-charge of Sesheke district Shapa Wakung’uma and superintendent Fleming Chilongo have applied for leave in the Lusaka High Court to challenge the Inspector General of police’s decision to retire them in national or public interest as unconstitutional and illegal. Wakung’uma and Chilongo who were retired after the Sesheke by-election which was held on February 12, 2019 have cited the Attorney General in this matter. Wakung’uma and Chilongo are seeking a declaration and order that the purported decision by the Inspector General of police Kakoma Kanganja under the hand of his senior executive officer of February 16, 2019 and communicated to them by a letter dated February 18, 2019 to retire them in national interest or public interest does not conform with the provisions of the Service Commissions Act of 2016 of the laws of Zambia and the Prisons and Service Commission Regulations as provided for under Statutory Instrument number 65 of 1976 and as such is manifestly illegal, unreasonable, procedurally improper and unconstitutional. The applicants want the court to quash the decisions of Kanganja and to further grant them an order of prohibition restraining the latter from retiring them in national or public interest. And Wakung’uma and Chilongo have stated in their joint affidavit in support of ex-parte summons for leave to apply for judicial review filed in court, that their retirement in national or public interest has come with a sense of shock to them as at no point in time have they misconducted themselves in any way or manner as police officers. The duo also stated that they have never been personally questioned in respect of any alleged misconduct relating to the Sesheke by-election by any superior officer in the Zambia Police Service. They added that they have also never been charged with any offence or alleged misconduct relating to the Sesheke by-election and at no point in time have any of them been asked to exculpate themselves in relation to the said by-election and/or related incidences arising out of the said by-election. Wakung’uma and Chilongo stated that this was a fit and proper case for the court to exercise its discretion in granting such leave which should act as a stay of the IG’s decision and that hearing of the case be expedited. Wakung’uma stated that during the Sesheke parliamentary by-election, he served as commander of sector five per an operation order issued by the provincial commanding officer which order directed the commencement of the operation to maintain peace from January 8 until February 14, 2019 while Chilongo served in the capacity of deputy commander in respect of sector one. It was submitted that despite Wakung’uma’s designation as commander, he did not assume command of the said sector as his deputy commander was given operations commander of the said sector five with full communications authority. Wakung’uma stated that on February 12, 2019 while driving to Sesheke Police Station, he was flagged down by the Minister of National Planning Alexander Chiteme who was in the company of deputy permanent secretary for Western Province a Mr Bukali. He stated that the minister and PS requested him and Chilongo to go to the scene of an incident of alleged police brutality involving alleged PF cadres at a place called Council Guest House and they proceeded there. 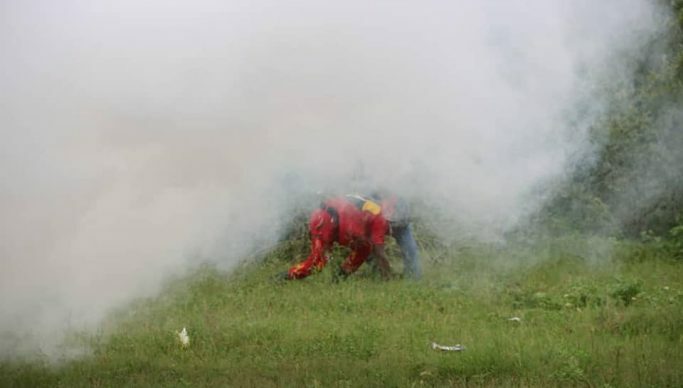 Wakung’uma stated that when they got there, they found a number of individuals laying on the ground having been severely assaulted while teargas being discharged in the location. Wakung’uma stated that he personally ordered the officers on site to immediately stop assaulting the suspected PF cadres, adding that the suspected assailants were individuals he personally identified as been from Kamfinsa Police Training College because he served there as operations officer. Wakung’uma stated that the assaulted cadres were taken to Sesheke Police Station where they were issued with medical reports to seek medical treatment and to make criminal complaints against the alleged assailants. The applicants stated that a day after elections, Police Commission chairperson Peter Chingaipe arrived in Sesheke on a fact-finding mission concerning what had transpired but they were not privy to the discussions in the meeting. They stated that later, they received instructions from the provincial commissioner of Police a Mr Lungu that an identification parade be held on February 14 at 08:00 hours but that the exercise was abandoned before commencing without any reasons been given by superior officers. The applicants stated that on February 16, media reports began to circulate on both print, electronic and social media that he and Chilongo had been retired from the police in national interest. Wakung’uma then received a form on the same day that they had been retired in national interest. He also received another Zambia police service message stating that he and Chilongo had in fact been retired in national interest.